I live in a house built in the late 19th century. One of the joys of living in an older home is the chance to restore and repair architectural features from the past. This gives me an opportunity to "look under the clapboards" and enjoy the craftsmanship of 100 years ago. A pleasure somewhat akin to turning over a pair of antique cufflinks to learn how they were designed and crafted. Unfortunately, every so often while working on the house I have a mishap. Recently I became entangled in a ladder as it fell to the ground and injured several vertebrae. After surgery last week the prognosis is good with 100% recovery anticipated. The downside is that over the past few weeks I haven't had a chance to follow up on my recent posts about the "Fleur de Lys" cufflink maker. I will pick up on this project next month and hope to post by the end of April. 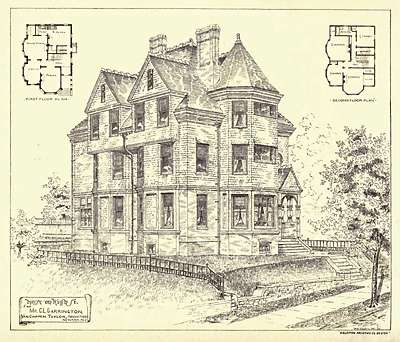 While falling on top of a ladder is no fun, it does give me an opportunity to post one of my favorite architectural drawings of a late 19th century house. This particular house was built be Charles L. Carrington around 1885. Mr. Carrington was the eponymous founder of Carrington & Company, the celebrated maker of elegant cufflinks and dress sets during the first half of the 20th century. Please click the above rendering for a larger view. I hope everyone is enjoying a wonderful early spring. Recent additions to the Antique Cufflink Gallery include an elegant pair of cameo portrait cuff buttons created by Tiffany & Co., golden pinstripe cufflinks from Carrington & Company, a striking pair of Art Deco cufflinks with zigzag borders, and dramatic fraternal cufflinks of an elk crashing through the tops. Tiffany Cameos Wealthy Victorians often shared cameo portraits with family members and close friends as tokens of endearment. This pair of elegant cuff buttons created by Tiffany & Co. is a wonderful example. Crafted in 18kt rose gold and platinum, circa 1870. Golden Pinstripes Elegant pinstripe cufflinks created by Carrington & Company. The pinstripe motif rose in popularity with the simpler, linear designs of the late Art Deco period. Crafted in 14kt gold, circa 1930. Deco Zigzag Elegant Art Deco cufflinks with jazzy zigzag enamel borders surrounding mesmerizing centers of concentric circles. Created by Wordley, Allsopp & Bliss in 14kt gold, circa 1930. Elk A seven-point elk crashes through the front of these intriguing, wonderfully sculpted cufflinks. These dramatic cufflinks were likely owned by a member of the Benevolent and Protective Order of Elks. Beautifully crafted in 10kt gold, circa 1900. Recent additions to the Antique and Estate Jewelry Gallery include two beautiful Edwardian jewels - a richly enameled stickpin and an elegant brooch set with an Old European Cut diamond. Edwardian Stickpin A white enamel border with gold fleur-de-lys accents surrounds a beautifully guilloched, blue enamel center with a rosy pearl is set in the middle. An elegant stickpin from the Edwardian era. Crafted in 14kt gold circa 1910. Edwardian Elegance An elegant Edwardian bar pin set with a sparkling Old European Cut diamond. Lace in precious metal. Crafted in 18kt gold, circa 1920.